Earlier today I attended "The Click Five Happy Birthday Party" event. I admit that I didn't know much about the band. I even thought they were a '60's or '70's group with the likes of similar names such as "The Commodores", "The Supremes", "The Cascades", "The Beatles" and all those other names that started a "The (insert word)... " trend. I had to research on them and so I visited their official website and at least realized that some current hits I've been hearing on the radio are theirs. And it's Kyle and Joey's birthday, 2 of the members of the band, hence the event theme name. Anyway, when I got to the venue, I thought it was going to be one of the usual press conference events where you are served food, you mingle with press people, wait for the artist, listen to the artist perform a bit followed by a panel discussion or open forum type of format. Instead, I was greeted with a registration desk presenting me with the things I could do while inside the venue. The sponsors each had their own sections offering something for the attendees. 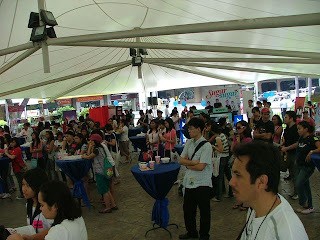 There was makeup at the Faceshop booth, free self-portraits at the Clique Booth and Sony booths, different kinds of candy at The Candy Corner, face painting at Skechers (the only booth that didn't appear relevant to their product) and food booths like It's Cool! drinks and Yoshinoya. Aside from this, majority of the people present were female and teens or to be more specific, screaming female teens (that's the effect The Click Five has and you gotta love 'em for that). 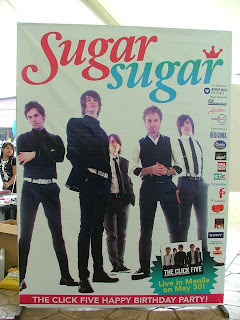 Thanks to friendster.com, a lot of the teens knew each other from being part of The Click Five friendster fan pages. 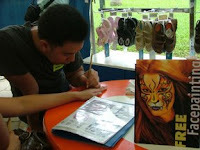 As I was feeling the culture and mood of the event, it suddenly hit me... it felt like a school fair during my teendays. School fairs had different booths like the jail booth, kissing booth and all other kinds of activities and entertainment for all. The average age during the event further made me step back and smile as to witnessing something similar to what I had experienced during my high school and college years. The girls were screaming each time the members of The Click Five were mentioned or shown on video. I wonder who was the "in" band during my teen years ? hmmmm... I'd like to answer "NSync" (to hide my age) but I think it was Color Me Badd... ok it was Menudo, but that was like before my teen years. It was all fun and I had a good time lining up at some of the booths. I skipped the make-up booth for obvious reasons. The face painter said that he could paint the hand but I was afraid that when I perspire, I'd accidentally wipe it on my forehead and it would smudge like I had charcoal on my face and look like I'm in guerilla warfare or worse, taong grasa (grease person). Feeling teeniebopper days ba Sweetie? Just remember... "The Nile is not just a river in Egypt." Now what should we do about that registration form hmmm?